Quite a few experts believe Juventus will finally be dethroned from their Serie A pedestal after 6 consecutive titles. However, even with a slightly weaker squad than last season, they still have Paulo Dybala, who might be the best player in the league, cementing his position with a hat trick in a 4-2 win over Genoa. 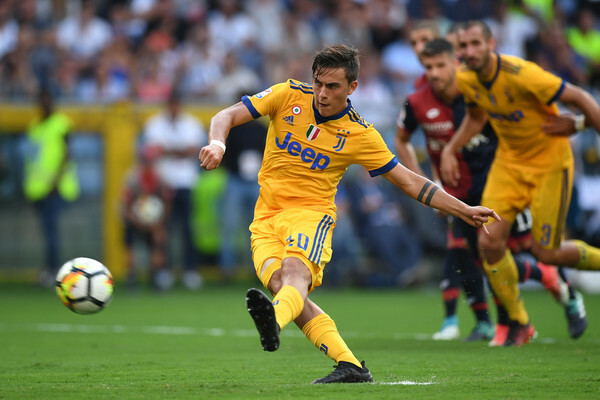 Dybala helped Juventus overcome a tough team in a tough stadium, one in which they lost 3-1 to Genoa last season. Miralem Pjanic scored an own goal to start the match, and 6 minutes later a penalty kick scored by Andrey Galabinov put the home side up by two goals. However, Dybala was just warming up. In the 14th minute, a nice 1-2 between Pjanic and Gonzalo Higuain ended with the Bosnian midfielder setting up Dybala for Juve’s first goal. Just before half time, a VAR decision rightfully gave Juventus a penalty kick, which Dybala converted. Juan Cuadrado put Juventus in front in the 62nd minute, and Dybala completed his hat trick in the 92nd minute, sending a powerful kick from a difficult angle to a corner Mattia Perin should really have covered. Not the best of football from the Italian champions and Champions League finalists only three months ago, but they lead the Serie A with as +5 goal difference and a perfect 6-for-6 points.